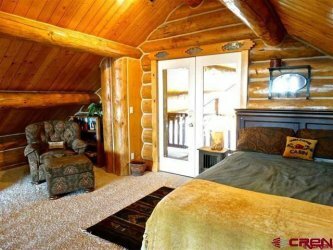 This beautiful log home allows for plenty of space for friends and family while simultaneously allowing access to world class fishing. Surrounded by nature on a 35.5 acre lot, this home provides remarkable views of Navajo Peak and the valley that are viewable from the wrap-around deck. 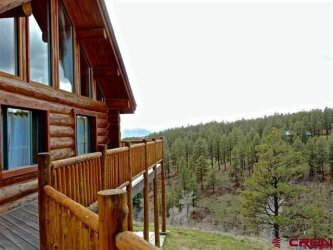 With five bedrooms, the master has doors that lead out onto the deck and into the beautiful valley. Also upstairs is the dining room and living room, which opens into the kitchen complete with double ovens and bar seating for the perfect get-together. The remaining four bedrooms are downstairs and all come with sinks to make the perfect home for guests. Downstairs is the family room, complete with a full bar, pool table, and walkout patios to embrace the surrounding nature of the property. 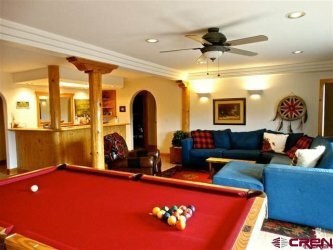 This home is ready for family and entertainment; also partially furnished, there’s no need to worry about not bringing enough!